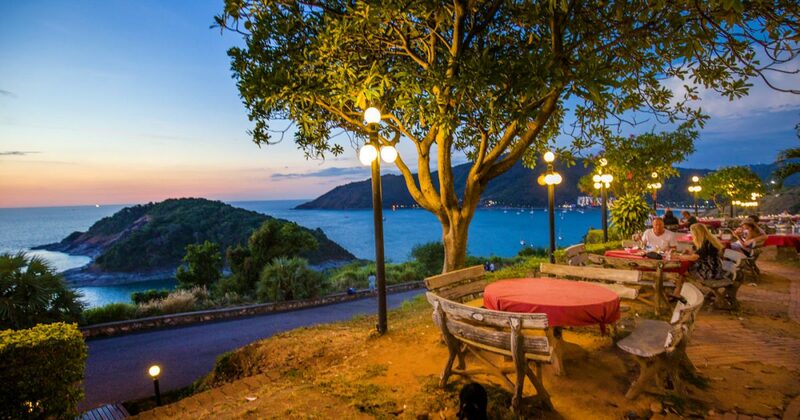 Promthep Restaurant is a surprisingly good place to enjoy a relaxing dinner with a view once you have your photos of the famous sunsets of Promthep Cape in the south of Phuket, just past Nai Harn Beach. Often overlooked by the thousand tourists visiting the area every day, it serves a surprisingly good Thai and seafood served by a friendly crew. 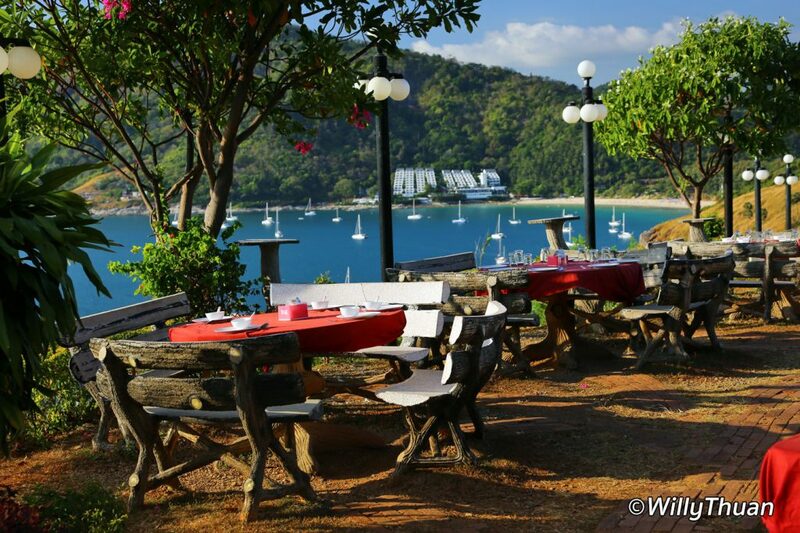 Set on a green hillside above the cape, Promthep Restaurant is a little rustic but large and clean (just for the anecdote, the toilet are super modern). The tables are those old-fashioned colourful concrete tables Thai people affectionate so much, with a red table cloth to make the place a little cosier 😉 . The sea breeze flowing through the trees, the ocean view and the garden lighting create a very relaxing atmosphere. It’s worth planning for dinner there. 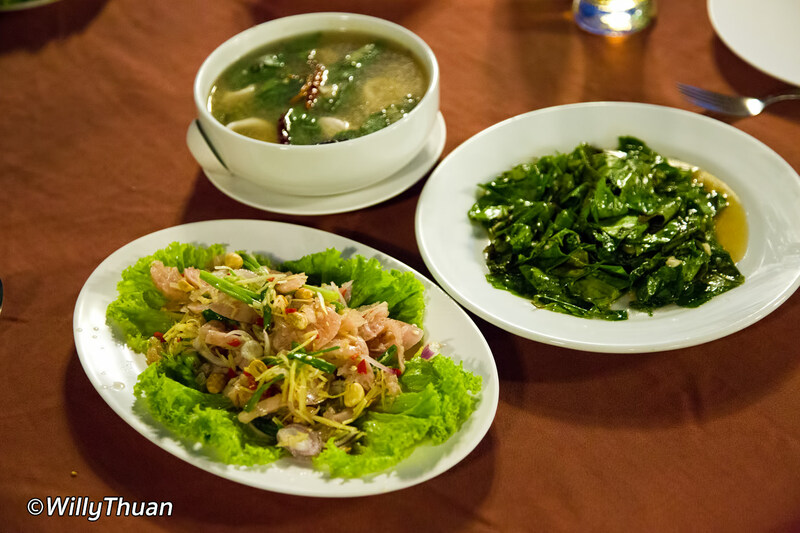 The food served at Promthep Restaurant is a good mix of Thai and seafood, very affordable and local Thai, which mean spicy enough. Lucky for you the menu is in English, and the many dishes are well described. A very popular dish seems to be the seafood baskets for two persons. 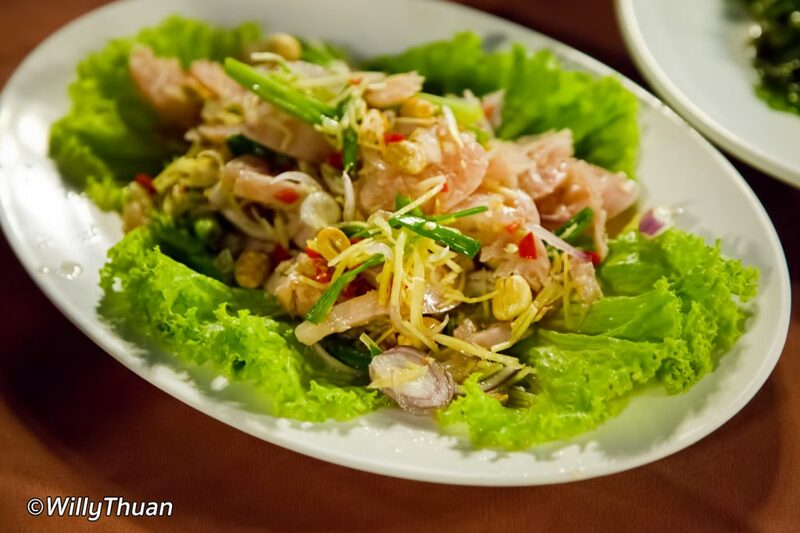 Starts at 1,500 baht for 2 with rock lobster to 2,300 with Phuket lobster. 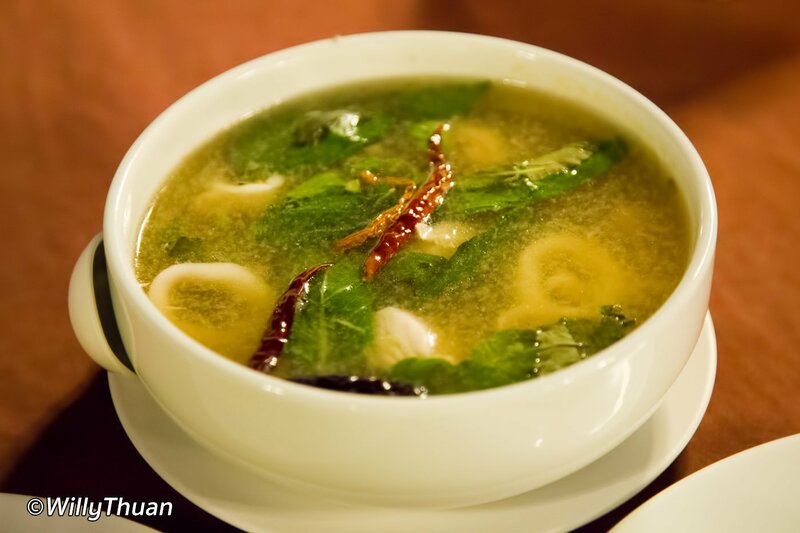 To give you a better idea of the price range for other Thai dishes, a chicken cashew nuts or a Tom Yum Goong cost 150 baht. 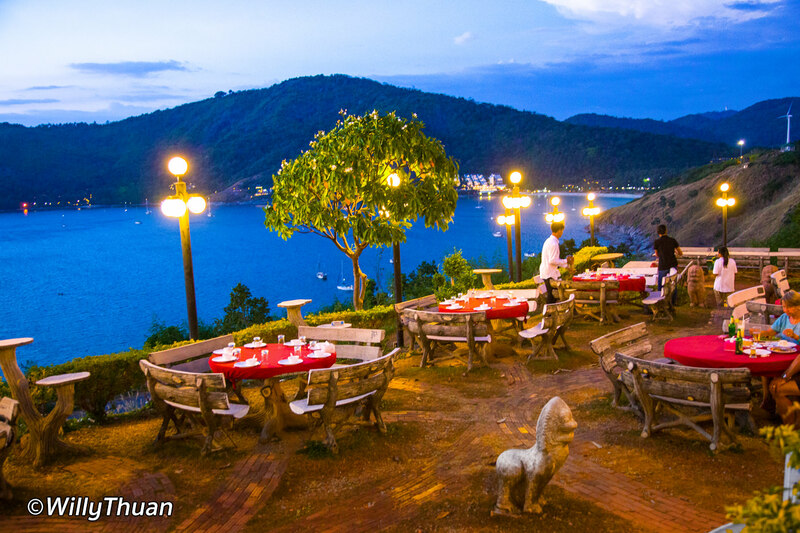 The entrance of Promthep Restaurant is a small path on the very right-hand side of the shop at the top hill or a tiny entrance directly from the front. 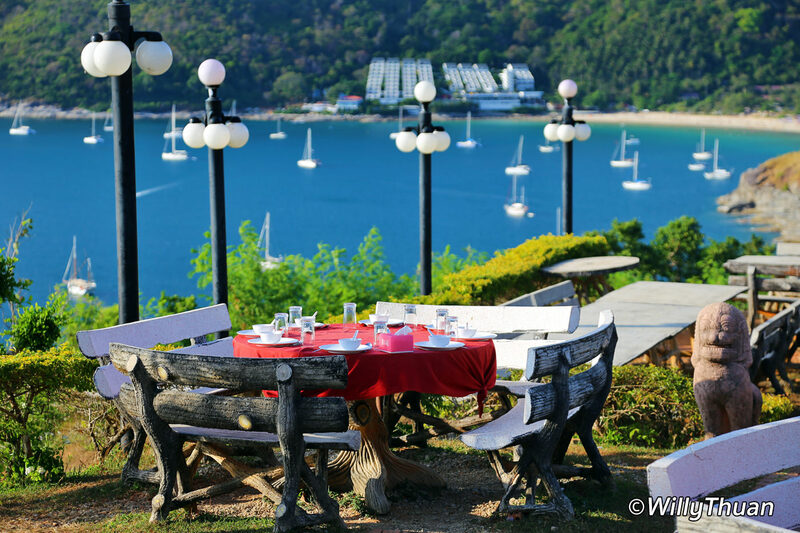 Since the best tables have the best views on the ocean, it would be a good idea to book your table as soon as you arrive, before you go and join the surprisingly huge crowd waiting every day for the sun to set. 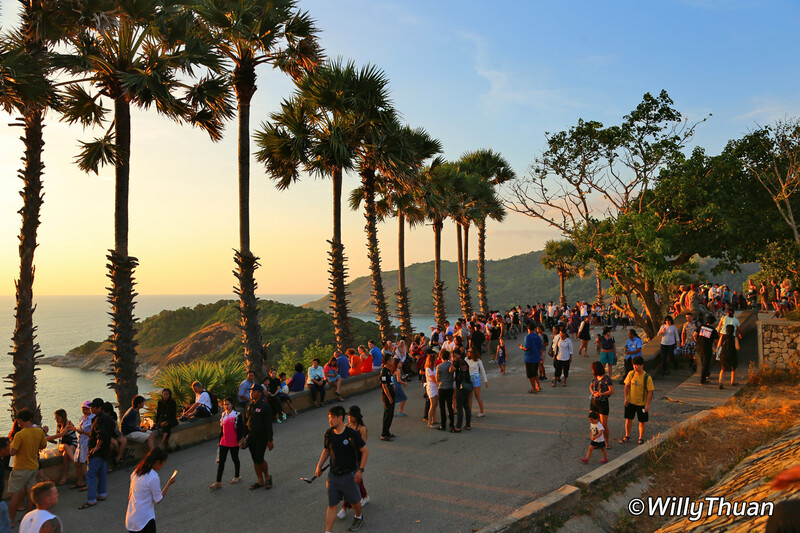 Promthep Cape is relatively quiet during the day, then around 5.30 pm, the first tourists arrive and start wandering around, doing some browsing at the many shops lining up the parking or paying respect to the elephant shrine. People keep coming and coming, and the entire area is buzzing with activity. A fantastic amount of selfies is shot each day at Promthep Cape; it is quite entertaining to watch. Around 6:30 pm, the sun sets, and it’s camera climax. 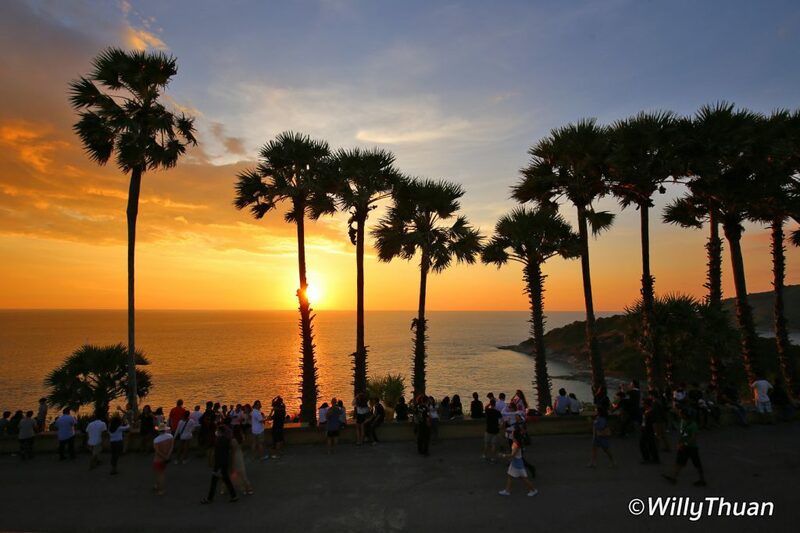 If you too want to get that favourite sunset shot, you can check the Sunset Time in Phuket here. Suddenly, as the sun barely touches the water and in a matter of minutes, the crowd vanishes. You have to see it to believe it. 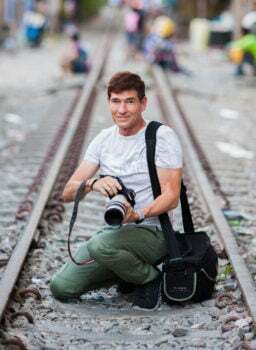 It’s a world of social network where people need that one photo to share and tick off the list. The place is all yours as the sky puts on a light show of amazing colours for you to admire from your table. Dinner never tasted so good.